The hard drive to beat SSDs? One day, SSDs will be both fast and cheap. Until then, the VelociRaptor delivers an attractive blend of capacity, performance and (relative) value. Western Digital's answer to SSD speed is its spinning platter hero, the VelociRaptor, and now it's got capacity too with 600GBs of storage space. Want storage performance though? Get an SSD. Sounds simple, but there is a snag. Solid state drives are still silly money. Enter, therefore, the Western Digital VelociRaptor 600GB WD6000HLHX. Western Digital claims it's the world's fastest conventional magnetic hard drive with a SATA interface. If true, that effectively makes it the quickest hard disk for desktop PCs. Whether it can compete with SSDs for raw performance, however, is another matter. Still, one thing is for sure. At £235, the 600GB VelociRaptor is expensive for a hard disk. 1TB disks such as Western Digital's own Caviar Black can be had for £75 or less. But compared to an SSD, you get a lot more storage for your money. Comparatively priced SSDs are no bigger than 100GB. Indeed, some 100GB SSDs, such as the Patriot Inferno, are significantly pricier. In that context, the VelociRaptor probably doesn't need to match the fastest SSDs for performance. It just has to be in the same ball park. 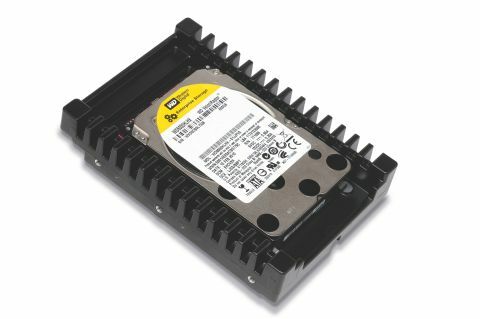 With speed-enhancing features such a 10,000rpm spindle and SATA 6Gbps support, it might be in with a shout.